Here are some excerpts from a letter written recently to the North American community coordinators by Bill Patterson. Bill, who coordinates the Mission in North America, is also an initiator. His satsang to the IHQ staff was printed in the last issue of The Golden Age. I know that you are all experiencing a lot after the programs that Guru Maharaj Ji has had recently. He has given us a lot of grace and a lot of love, and in the course of such a short Period of time he has cut away so many concepts and doubts, and has penetrated so deeply into the hearts of so many premies. It almost seems too much to believe. Yet I know that for me, it is that power of Guru Maharaj Ji that inspired me in the first place to dedicate myself to him and serve him. Guru Maharaj Ji now is just confirming something that I have known and felt for a long time - that there is lots of hope, and that we really can come together in love and experience the deepest reality of our lives. ing and working and "hassling" and getting burnt out, just to be able to come into a hall at the last minute to try to somehow experience Guru Maharaj Ji's satsang. Instead, it began with satsang and meditation, proceeded with satsang and meditation, and ended with an incredible experience of satsang, meditation, and Guru Maharaj Ji. So subtly, yet so perfectly, Guru Maharaj Ji is working with us, taking us beyond our limitations, showing us a potential that most of us never dreamed we had. I see that he's molding us and strengthening us to really be premies, to be lovers. He wants us to have impeccable love and faith in him so that we can be with him in spreading this Knowledge in this world. Shri Maharaj Ji used to say that Knowledge without devotion is dry, and devotion without Knowledge is blind. It's so easy to see the subtle balance between those two. Last summer a lot of premies experienced a lot of focus on Knowledge, but their experience was dry, because the focus on Guru Maharaj Ji had been lost. Now there is a strong focus on Guru Maharaj Ji, there is a whole wave of devotion for him, but we don't want the other extreme either, because devotion without a steady, dedicated practice day-to-day of the Knowledge is blind. I see the same need for balance regarding Divine Light Mission. These recent programs have been so spontaneous, so much on the spur of the moment, that the organisation has almost been on the sideline. Premies just came together and the programs happened. Before, whenever programs or festivals happened, it was the other way around, the organisation was so much involved that it almost became a barrier between Guru Maharaj Ji and the premies. 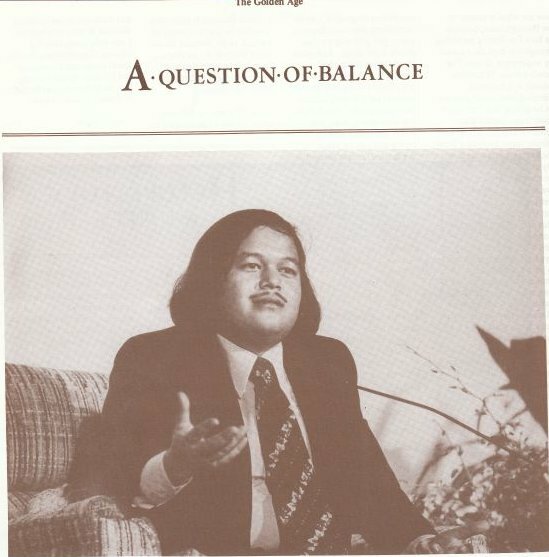 Before this Denver program, Guru Maharaj Ji expressed his concern that we not swing to the other extreme, and let the organisation cease to be involved. Every detail of Maharaj Ji's plan is important, and we all have to be really clear in our own understanding, so that that balance can always be maintained. Since I took over this service back in Denver, I haven't really done much at all in terms of actively working within the Mission, but to me that feels really good. Guru Maharaj Ji has given me time to really settle into the experience of Knowledge, and has shared a lot regarding the direction that he sees the whole organisation moving. In the conferences he has had after each of the programs, he has shared the essence of his plans with each one of you directly. To me that is so beautiful. I only want to serve Guru Maharaj Ji. I don't want to be into a role or initiate activities that in any way conflict with what Guru Maharaj Ji wants. He has expressed that he wants the Mission to be strong and shining, so that it can be a tool that is completely responsive to him. As he explained to me a couple of weeks ago, we don't have to be responsible for coming up with ideas. He will come up with the ideas, and we just have to be ready to implement them. Guru Maharaj Ji is ready to move. He's got lots of incredible ideas that he wants to do, but until the Mission is strong financially and legally, and until the premies working within the Mission are clear and strong in their focus, Maharaj Ji can't really move ahead, and do the job he wants to do. As Guru Maharaj Ji manifests more of himself, one part of us is really uplifted; the innermost part of our soul soars with joy, because Guru Maharaj Ji is the inspiration of the deepest part of our being. But the other part of us, the mind, will freak out even more as more and more energy builds. This is our joy to be involved now in the service of Guru Maharaj Ji at this time, though now also is when we have to be especially focused. Several times during the last two and a half months Guru Maharaj Ji turned to me and said, "Do you know now much mind you'll be confronting in this service? Do you know how intense it will be for you?" And each time I would squirm a bit, not knowing how to answer him. But then he would wink and say, "But if you always stay focused in satsang, service, and meditation, then everything will be okay." I sigh with relief. I want to pass this along to you because to me, for all of us, this is our number one priority as coordinators: to be always focused in Knowledge. I'm experiencing that Knowledge is becoming a part of my life. It's not something I have to force myself to do; it's not something outside of myself that I have to struggle with. It's my life itself. Once we understand that our whole life, our every minute, is meant to be involved into the practice of Knowledge, then all that is left for us is to perfect ourselves in satsang, service and meditation. Then we can make that extra effort to be more concentrated in meditation, more attentive in satsang, and more surrendered in our service. And then the experience will grow deeper, and deeper, and deeper, and there really is no end to the perfection and the beauty that can be ours. Knowledge is the means that Guru Maharaj Ji has given us to connect ourselves to him. By practising Knowledge and experiencing that truth in our lives, our faith in Guru Maharaj Ji will grow. When our faith is strong, nothing is impossible. Faith can move mountains, and even though I don't think there is much necessity to move mountains, we can serve Maharaj Ji and experience a total surrender to his infinite power. As you've probably noticed, the price of The Golden Age has increased to $1 with this issue. This will allow us to come closer to covering costs through publication sales than has been possible previously, thus reducing the drain on AMP funds. Here is a breakdown of the costs involved in producing an average issue of The Golden Age. 700 copies are printed for sale, therefore the average cost per copy is $1.32. So as you can see, $1 doesn't quite cover it, but we thought it best to keep it at a round figure. And we're still looking for ways to reduce expenses.